Hello! I have a lot packed a lot of tips into today's short video! 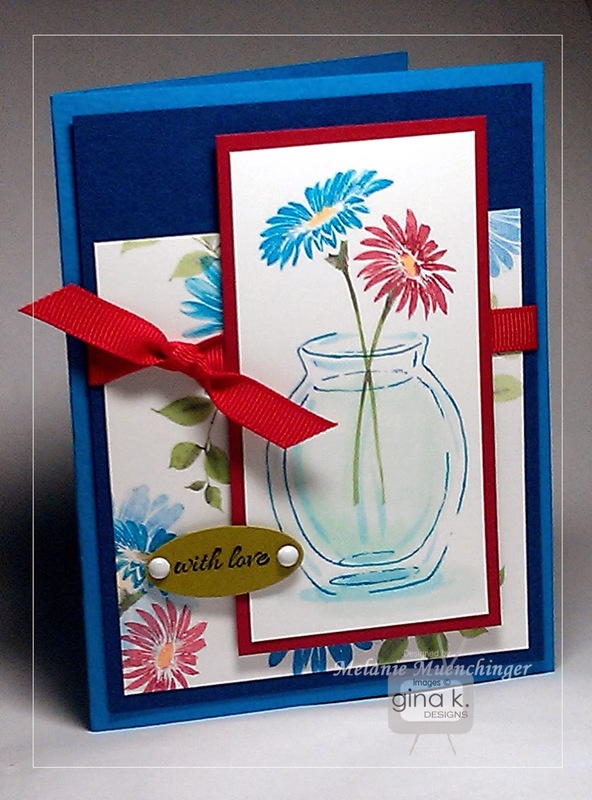 For this single layer card, watch how I mask the two flowers, add contrasting colors for a two toned effect, and bend and elongate the stems so you can easily customize the image to fill out your different layouts. Please enjoy! Gina will be sharing this video next Monday, but *my* blog readers get first look! :) Thanks for being a subscriber! If you are not already, please sign up or follow me so you don't miss a post. Good morning! Here is my newest video. 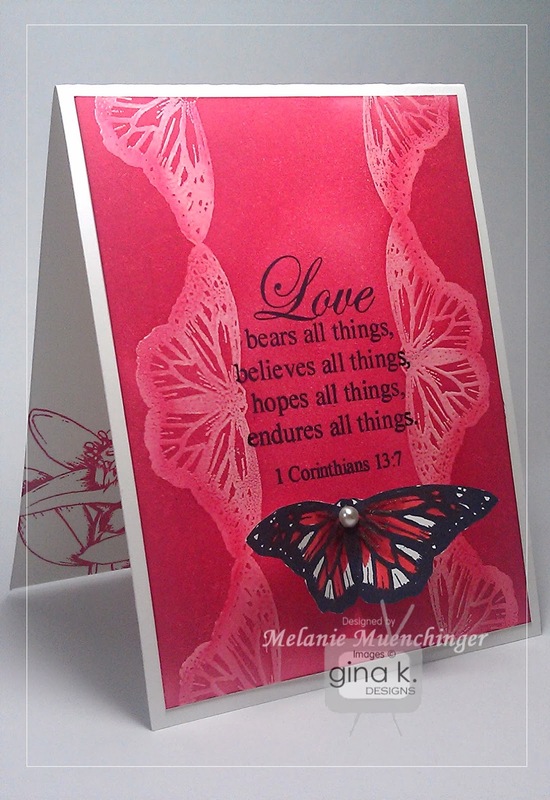 I am pairing up the Love chapter verse from Stately Flowers 8, showing how beautifully it works as a focal point on your cards, with the butterfly from Make a State-ment, a set I planned to work with every set in the Stately Flowers series. 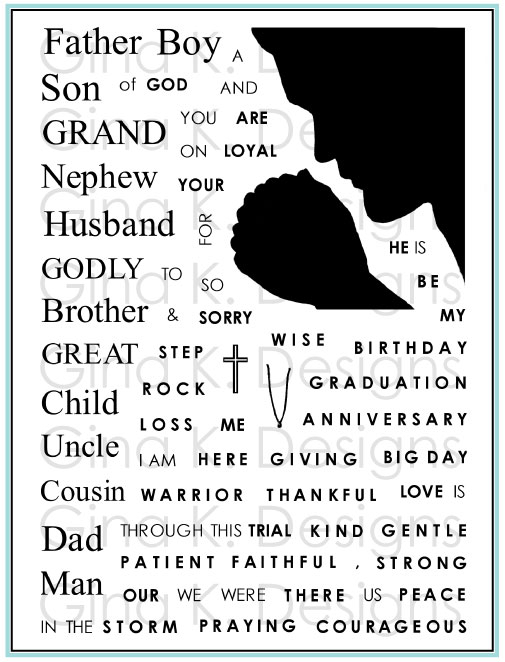 (The greetings in this set can be used stand alone or paired with any of the state names or flowers. The map and its pushpin and arrows are so fun!) 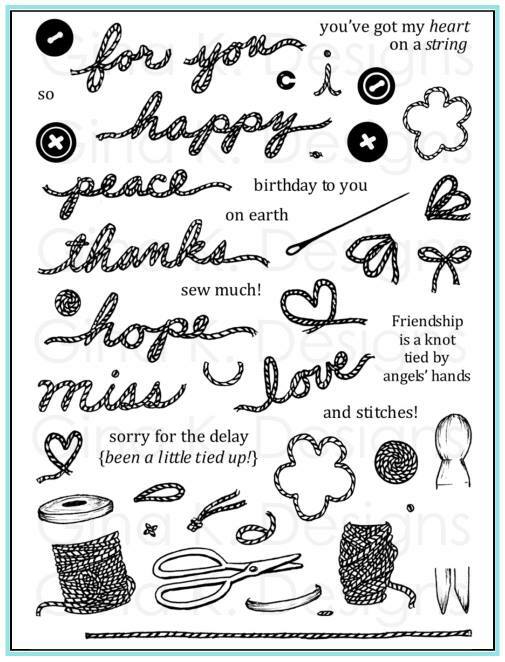 You'll see how easy it is to create the look of a lace border (which is also dimensional) with this emboss resist technique. Good morning! Here is another sample I shared at the party. In terms of how much stamping and time was involved, it pretty Clean and Simple, but the detail in the images gives it a much more elaborate feel. To color these flowers form Stately Flowers 8, watch my video and substitute a pink for the BV31 Pale Lavender. on the petals. The pink touches make these orange blossoms a bit more like stargazer lilies. I love the shape these flowers make, and even more so the way the petals "nest" together when you flip the image and stamp it above the first. You can almost "draw" an oval around the two bunches with your eyes (Fabergé egg?) and I just think it makes such a pleasing layout on this Pure Luxury White and Bubblegum Pink card. 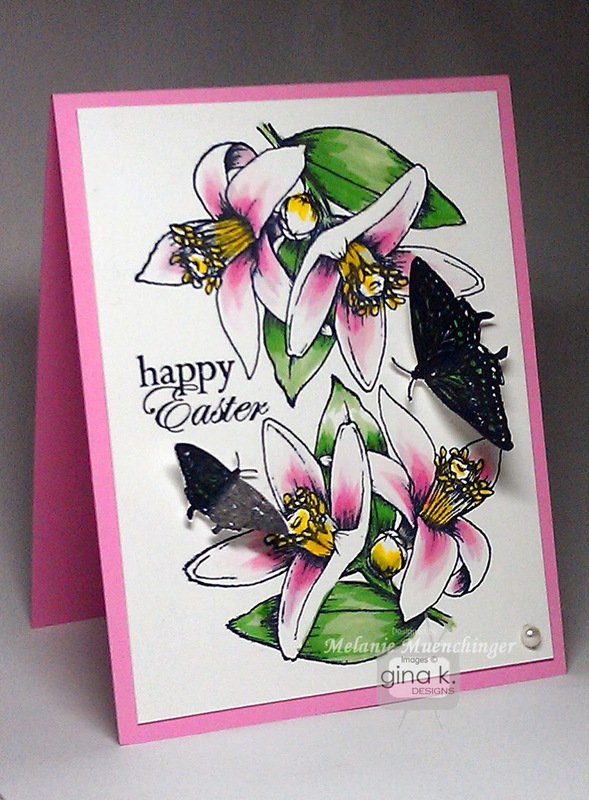 I stamped the greeting into the white space and accented with the sets two butterflies (stamped in black and colored with green Finish with a pearl and this two layer card is complete. A new video for you on Monday! I've packed a lot of tips into this one, and think you are going to love it. Have a terrific weekend! 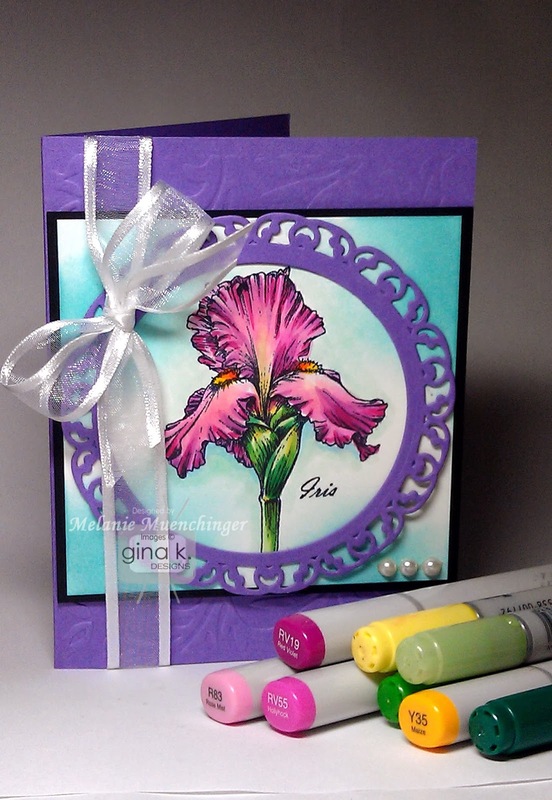 Well, I have decided to share this card today, the first I made with my set a few weeks ago and I was on the fence about it only because I knew from Monday's hop that Sharon would be sharing an iris sample with very similar colors in her own step by step tutorial for Copic (just posted, have a look!) , and I wasn't sure, "Do people even need to see a video for this after seeing that?" I think not! Pretty similar, no? I made the frame with a Stately Circles Spellbinders die* and Cuttlebugged the base with Victoria Folder. backgroudnis sponged with Ocean Mist. *Isn't that perfect? "Stately" with a "Stately"? Good morning! Here is the Yellow Jessamine from Stately Flowers 8. This image, with it's smaller flowers and tighter areas, is pretty straightforward to color, so I thought I'd change it up and share how to show off just the outline. I do like how tall and elegant it is, really nice for portrait style cards. I don't do the Smackin' Acetate technique very often, but it's really fun, especially under florals. I may as well, I have all the reinkers now, and I always love the interesting, one of a kind results! It's also a nice way to let go of your perfectionism (if you possess any) have to release control of the design. Just add a few drops of reinker to your 6x6 block or acetate sheet, spritz with water and press! Pull the cardstock away, and surprise! Here I used some Sweet Mango, Sweet Corn and Fresh Asparagus. The little bits of red you see were some Cherry Red that didn't get cleaned off my block when I made some other cards that day with this technique! Hey, I like it! 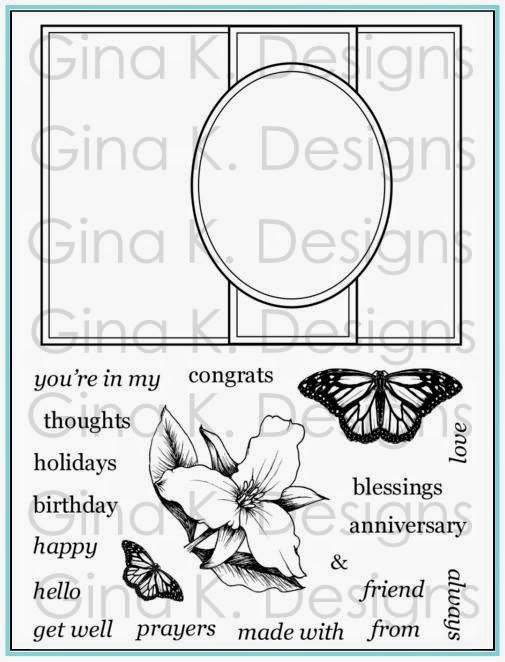 Stamp your images after creating the background in Gina K. Black Onyx. You may need to use your heat tool to dry it if you used a lot of water or to flatten it if the edges are curling. 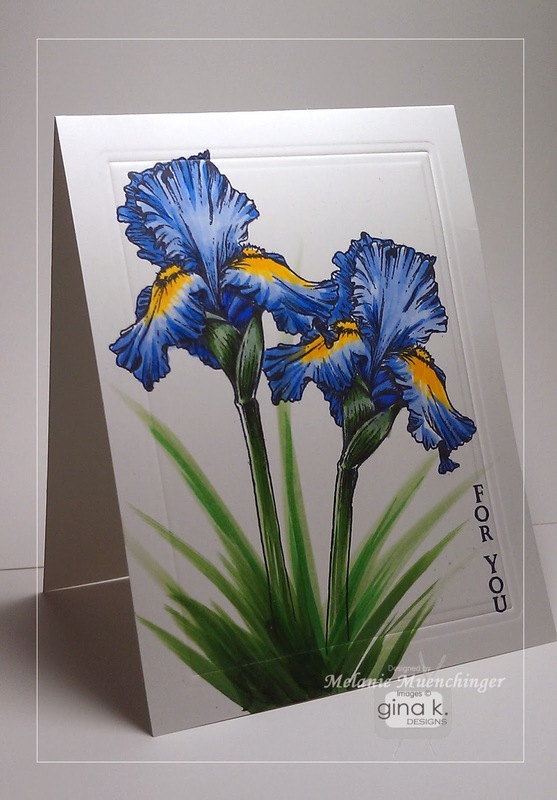 I used the little vertical "FOR YOU " greeting from this set so it can be an any occasion card in a pinch. Cardstock is Pure Luxury Sweet Corn, Black Onyx and White. If you would like to do some coloring on a card like this, go ahead. 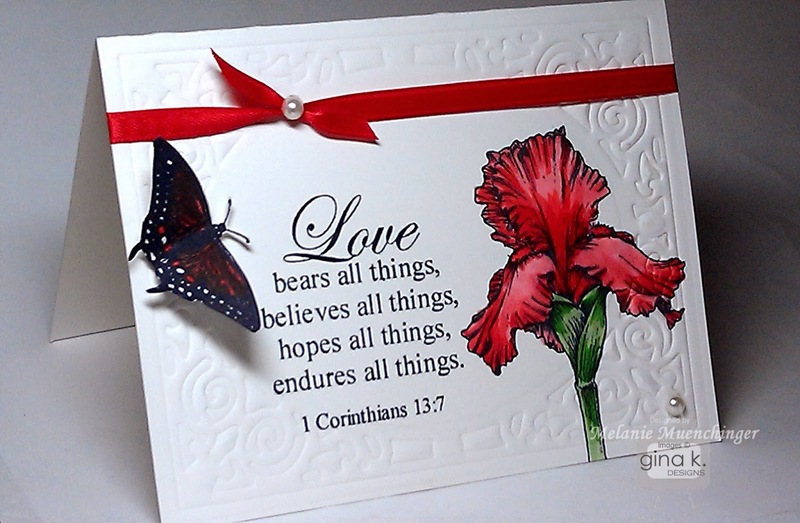 Just color over the leaves in green and the flowers in warm color like red or orange (a cool color like blue or purple will turn muddy over the yellow tones) Maybe I'll do that and come back with a stepped up version of this card, even add some ribbon and bling! Let me know if you would like a smackin' acetate video. As always , please feel free to request specific techniques in the comment section. Have a terrific Tuesday! Thanks for visiting! Good morning! 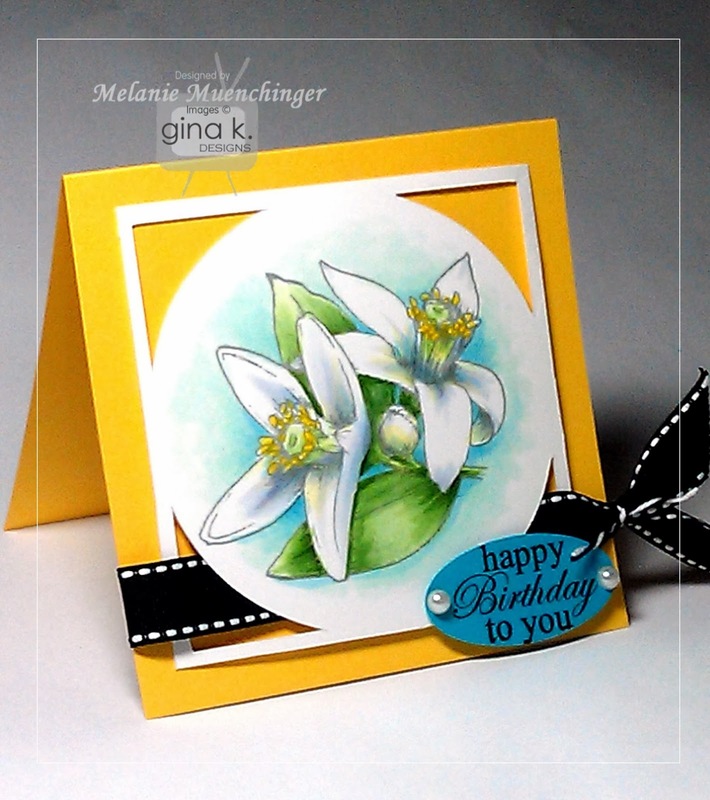 The Cast and Crew for Gina K Designs welcomes you to another fabulous Inspiration Blog Hop! 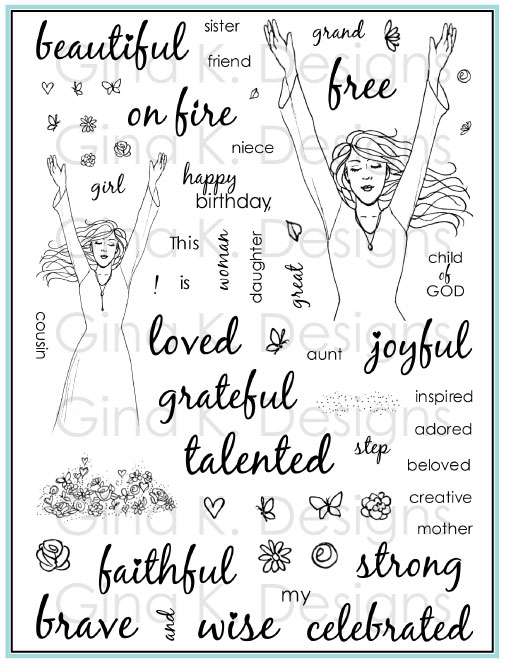 Gina and Cast &Crew will inspire you with many beautiful ideas for the newest stamp sets from Gina K. Designs. 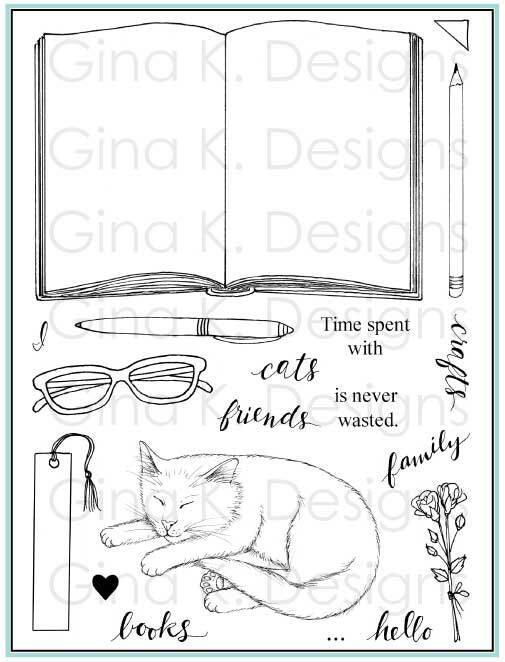 As you hop through our blogs, make sure to leave a comment on each of them because we will choose a few random comments and those stampers will each win a grab bag of Gina K. Designs products. To see the full list of winners check the Big News Forum at StampTV a few days after the hops. 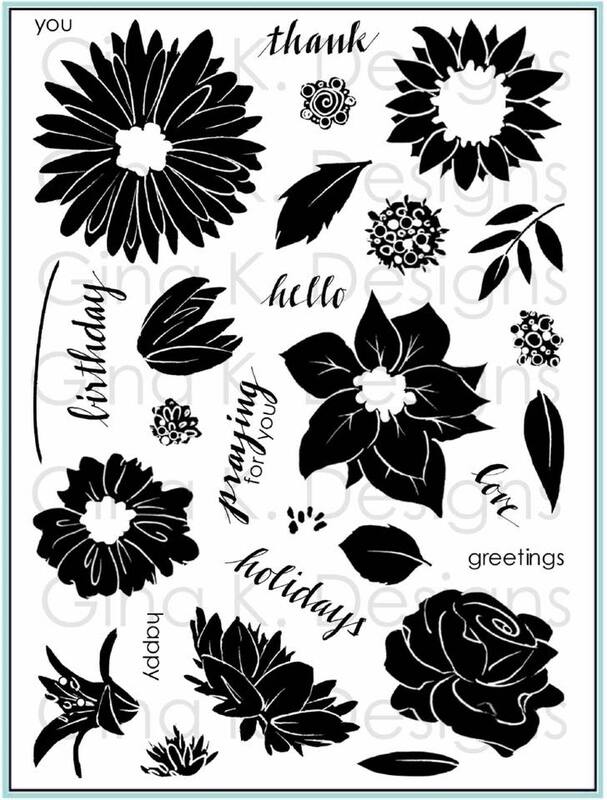 Are you as excited about the new Stately Flowers 8 set as I am? 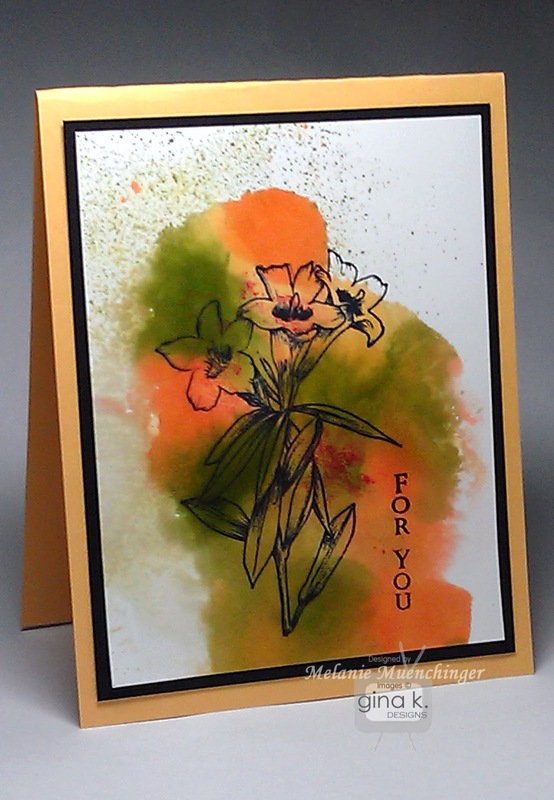 Today I have a video for you on how to color the orange blossom on the card above. White flowers are really enhanced when you add just a few shadows on them and a little color around them so they don't fade into an already white background. It's simple, I promise. Supply list for this card below. Please enjoy! I hope you will try this technique even if you don't have these exact markers. 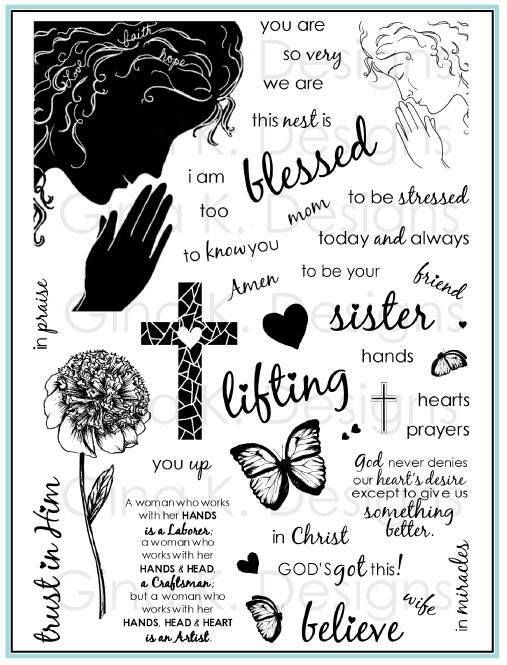 Don't forget to download the free cut file if you have a Silhouette! 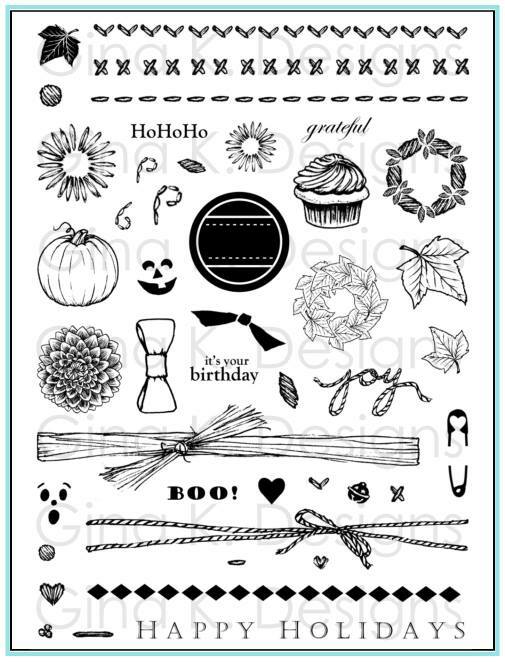 The next set we are showcasing is Beth Silaika's Lots of Washi. I decided to two-step stamp the two diamond borders to create this harlequin border using Charcoal Brown for the outline, Grass Green for the bold filler, and Dark Chocolate just to add a few diamonds in side. I also used the Dark Chocolate for the greeting from Lots of Lines and added the single diamond to make an accent below "thanks". Base is Warm Cocoa and I used the Color Companions Kraft button mix to pop up above the pattern. Now please check out more amazing designs and inspiration from our Cast and Crew. Don't forget to leave comments for more chances to win a prize! Have a great day! Melanie Muenchinger-Illustrator of Stately Flowers 8, you are here! Good morning! Thank you for coming to our release party last night! If you were not able to make it, you can still look through the party chat thread to see our design crew and guests' samples with the new sets, as well as enter our release contests on StampTV. Don't you love how Gina was able to share our new videos on the main page? 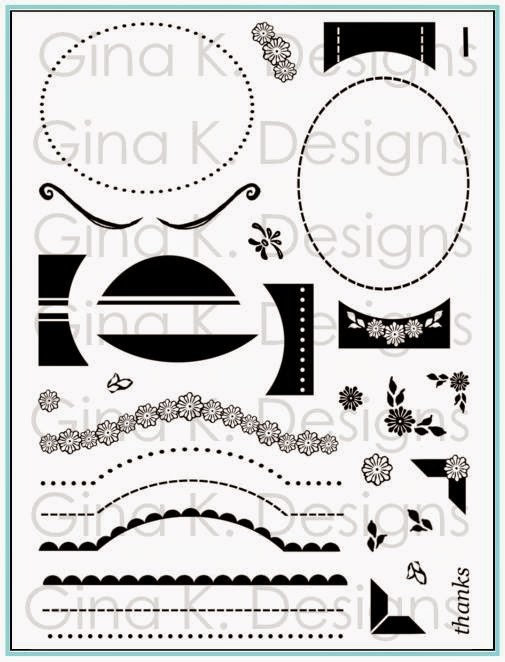 Stately Flowers 8 is now available for purchase in the Gina K. Designs store, as well as our other new sets in the What's New category. 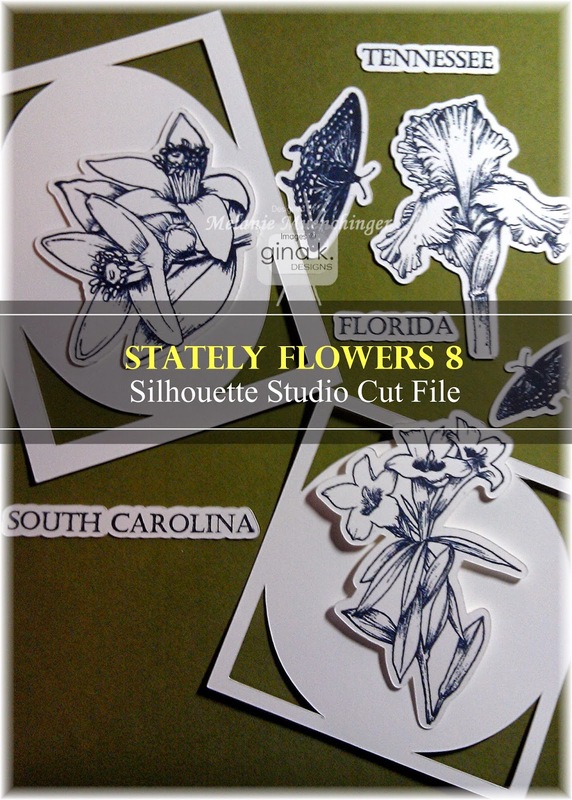 Be sure to download your free copy of Stately Flowers 8 Studio File on the STV Freebies page, which includes all the cut outs you see here. Even if you don't get this stamp set, the frames themselves are incredibly versatile and are great for framing any images in your collection to make a quick card. Images not included, they are just stamped so you can see. You will need the Silhouette software to run the file and a machine to cut the images. A new video for you on Monday with the Florida Orange Blossom when we hop! Have a terrific weekend! Happy Valentine's Day! Good morning! Today, the Illustrators have put together a little invitation hop for you! This hop features stamps that will be released tonight! So come hop along with us and don't forget to add a comment on each blog. We will pick a random winner to win an awesome grab bag of Gina K. Design Goodies!! On Monday, I will be sharing another video during our hop using one of the frames in my Stately Flowers 8 Studio cut file, which you got a peek of at the beginning of today's tutorial, free for all of you starting tonight on the StampTV Freebies page. Surprise! A peek for you this morning! Do you know this flower and what state it is from? 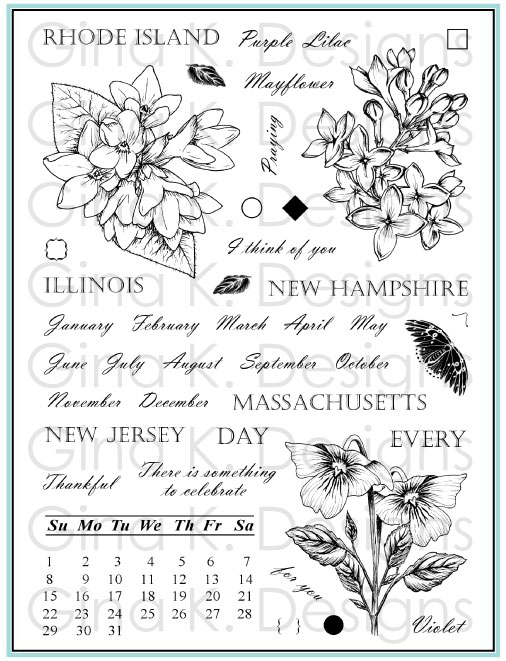 What *other* flowers do you think might be included in the new newest Stately Flowers Set! 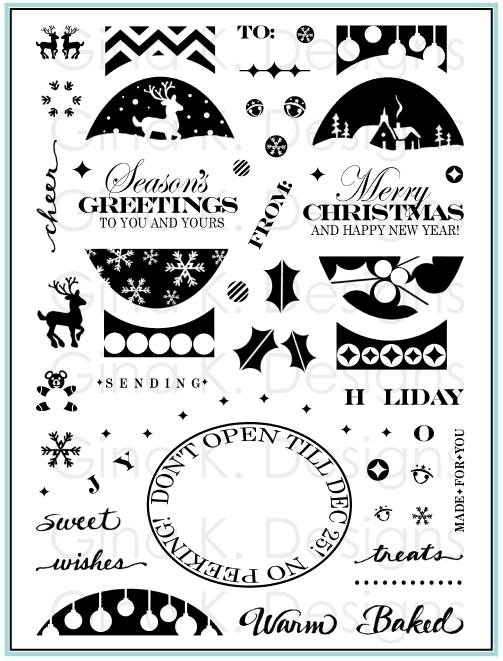 Coming this Thursday from Gina K. Designs! If you have not already, please be sure to "Like" my new Facebook page Melanie Muenchinger Designs which I am dedicating to all my artwork: stamps, cards, books , videos. There isn't much on it, but soon there will soon will be! Just getting started, better late than never! Hope you had a terrific weekend and your week is off to an excellent start! Here is that video on coloring a vase with water that I've been promising and you've been waiting for, thanks for your patience! I hope you see how easy this is to do. You could take more time and use more colors for even more realism, but I think this works perfectly for the style of the illustration and the whimsy of the flowers. If you don't yet have the Buds and Vases set and love florals, I know you will enjoy all the variety it gives you with the different container stamps. It is still one of my favorite sets. 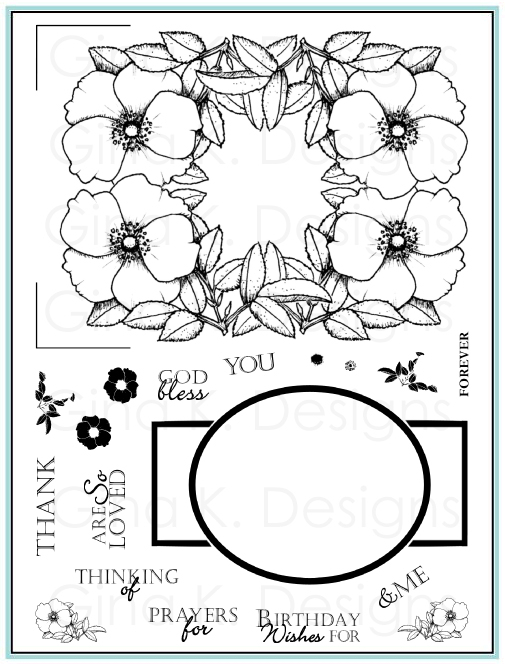 I must say, I was very tempted to plop in one of the *new* flowers form my new set releasing next Thursday from Gina K. Designs instead of the Journey of the Heart flowers on this card, but that would have been a bit premature! Soon, I promise! Don't worry if you have an open space behind your flowers on the vase. (See above!) If that really bothers you, place your floral image over the vase when inking so you can see exactly how much of the back of the vase to leave open/uncolored. Know what I mean? Poor Sadie, she wanted to help so badly. My craft room is where all her "stuff" is, after all. But, it just wasn't going to happen. Although the video is short, you'd think from that pitiful crying I shut her out all day! Next time, instead of her shutting her out, I might need to shut her in my bedroom with her "stuff" on the other side of the house. Poor Sadie.